Please refer to our stock # 3271 when inquiring. 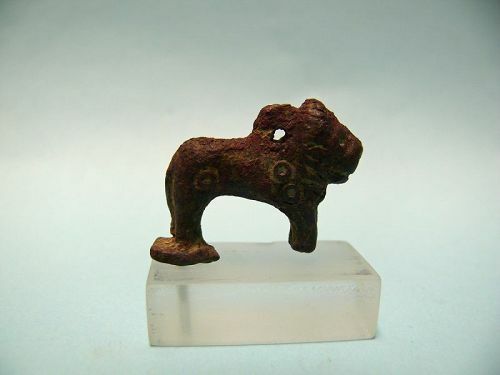 Luristan Bronze Finial of a Lion, ca. 1200 - 800 BCE. With curly mane and loop on back of neck. In excellent condition, 1" x 1 1/4" x 1/4", on custom lucite stand height is 1 1/2". Luristan bronzes are small cast objects decorated with bronze sculptures from the Early Iron Age which have been found in large numbers in Lorestān Province and Kermanshah in western Iran. They include a great number of ornaments, tools, weapons, horse-fittings and a smaller number of vessels including situlae, and those found in recorded excavations are generally found in burials.The ethnicity of the people who created them remains unclear,though they may well have been Persian, possibly related to the modern Lur people who have given their name to the area. They probably date to between about 1000 and 650 BCE.